Francis Hugh Bradley was born in Sutton Bridge, Lincolnshire, on 8 March 1886. Known as Hugh, he was the third child of Samuel and Elizabeth Bradley. When he was five the family moved to Lake Cottage, Lake Lane, Frampton, where Samuel set up business as a builder and decorator. By 1901 Hugh and his older brother, George, were working for their father as a bricklayer and carpenter respectively but severe unemployment in the building trade encouraged Hugh and George to emigrate. Hugh returned in November 1915, sailing from Sierra Leone on the SS Burutu when he was described as a foreman of works. No enlistment records have been found for either Hugh or his younger brother, Percy John. Hugh was a keen footballer and enjoyed motorbikes, and family members believe that during the war he was a Dispatch Rider. 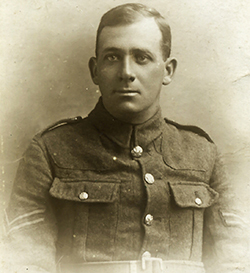 He was photographed in the uniform of a corporal in the 119th Railway Company, Royal Engineers, and according to the Medal Roll he reached the rank of acting sergeant. Like many Army personnel of the period, Hugh’s records give more than one identity number; initially these were allocated at Regiment or Corps level, but the huge expansion of the Army and the many transfers (each requiring re-numbering) caused administrative confusion that was solved by a move towards a single Army-wide system. Hugh received the British War Medal and Victory Medal and his service is also commemorated on the plaque in the Village Hall. On 21 June 1919 Hugh became a Comrade of the Great War (one of the original four ex-service associations that amalgamated to form The British Legion in 1921). He spent many years working abroad in the building trade; in June 1923 he sailed on the SS Morka from Marseilles to Plymouth as part of his journey from the Malay States back to Frampton. In 1938, as a buildings overseer, he sailed from London to Singapore on the Hakone Maru going to the Straits Settlements. It is thought that he worked for the Singapore Harbour Board but left when the Japanese invaded. In August 1945 he returned from Australia to Oatfield Cottages in Whitminster Lane, Frampton, listed as retired. Francis Hugh Bradley died on 5 November 1947 and was buried in St Mary's churchyard.